12/1/2010Share this story on Facebook! 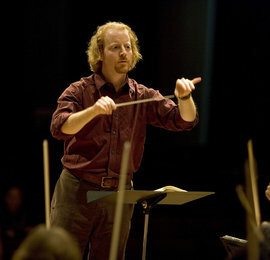 Jeffery Meyer conducts the Ithaca College Symphony Orchestra, which is comprised of 90 to 100 student musicians who play five to eight concerts a year. The orchestra is the largest ensemble at the college and frequently collaborates with guest composers, like Daniel Hege from the Syracuse Symphony and Jose-Luis Novo from the Annapolis Symphony. The IC Symphony Orchestra is open to all IC students by audition. Auditions take place during the first week of classes. Last May, the orchestra performed pieces by Pärt, Shostakovich, Schnittke, and Lutoslawski in its New York City debut at the Wall to Wall Festival at Symphony Space, a free, daylong cultural gift to New Yorkers. Two years ago, the IC community got in on the action when Meyer, now a professor of performance studies and director of orchestras at Ithaca College, brought a group of School of Music professors and students (called Kulmusik) to St. Petersburg to play with the orchestra. “To see this non-Russian-speaking American student from Ithaca College next to a non-English-speaking Russian musician and have it work beautifully and seamlessly was something,” says Meyer.